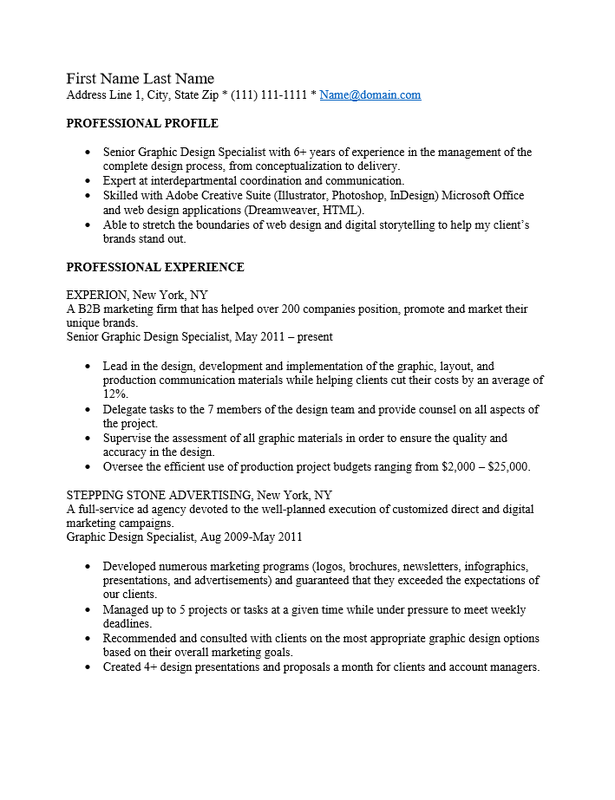 The Professional Graphic Design Resume Template affords a job seeker the opportunity to introduce themselves to many potential employers with a personalized resume in a relatively short amount of time. This is accomplished by using the template to create an original master document with all-inclusive content in relation to one’s skills, experience, and profile. Once this is done, a job seeker may simply copy and paste static information from the master copy to a new template, freeing him or her to concentrate on personalized content aimed directly at the position of their choice. A professional graphic designer will have a lot to put on one resume and recruiters are usually interested in content that directly applies to the position they are seeking to fill. By focusing a laser upon the job requirements a candidate may leave a very positive impression on a recruiter. It is likely the most lucrative contracts will be extremely time sensitive, so utilizing a time saving tool such as a resume template will make the difference when one desires to pursue such an opportunity. Step 1. The top area of a resume is reserved for a candidate’s name and contact information. This will be how an employer will contact you so it must be up to date. Step 2. The first section is the “Professional Profile” and is basically a list of your experience and skills. It would be wise to address some, ideally all, of the requirements listed for the job position. After all, if your skills fulfill all the job requirements then a recruiter will pay close attention to your resume. Step 3. The “Professional Experience” section is where you will definitely state your experience. Your employment history should be in descending chronological order. For each employer give the name of the employer, location, a small description of that company, the official job title you held, and the dates you were employed in that job title. Following this initial information should be an outline of how you spent your time in that position. Step 4. The “Education” section will be where you may report you’re the credentials you earned academically. Give the name of the school you attended, its location, the degree title you earned, the year it was awarded, and any relevant information that may be impressive. Step 5. The “Additional Skills” section may be used to report on more common skills or those that, while they may not directly relate to the job in question at the moment, may be useful to the employer in the future.